These are my sharpest memories of Girls’ Week at Laurelville Mennonite Camp just off the Pennsylvania Turnpike not far from Pittsburgh, PA. along with . . . 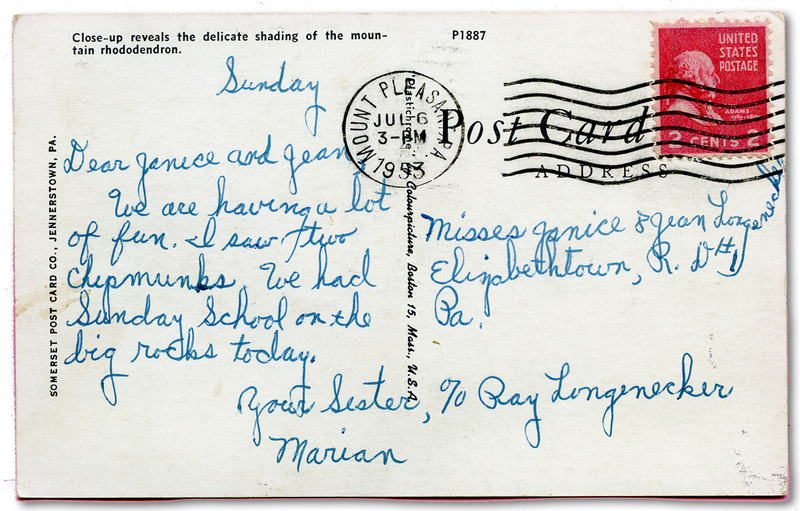 The postcard I sent to my sisters from Laurelville reveals the price of postage stamps, an address that winds around the edge in cursive script, and simple declarative sentences. It also tells how I felt, what I saw, where we worshiped. Memories of family week with my sisters and parents at Laurelville left a different imprint. We also sang something new to us: How Great Thou Art, a Swedish hymn written in 1885, which became an instant sensation in Christian circles in 1955 because of the Billy Graham Crusades. When through the woods and forest glades I wander, I hear the birds sing sweetly in the trees; when I look down from lofty mountain grandeur and hear the brook and feel the gentle breeze. What are your memories of camp? Here’s the place to share them – songs, games, mischief – other memorable moments. Good morning, Marian! I never went to camp, other than a few weekend Girl Scout camps. Well, I guess this could be a vicarious experience for you, Merril. I’m guessing you like chipmunks (and squirrels) too. I thought Dew Drop Inn was the cleverest ne ever invented. I loved Laurelville Camp, Marian, and went there two consecutive years. No family camp, however. Cows to milk! As I look back, I am shocked that Daddy took us to Laurelville for a whole week in light of the fact that this was the busiest time at the shop – farmers needing repairs on equipment and pronto. I have to assume he had good help at the time or it never would have gone. As I mentioned in the Father’s Day tribute, he loved, loved, nature. Such a relief from his confinement indoors and the strains of running a business. Amazing how you kept so many pictures letters and cards. I have a hard time keeping anything. Not even scrap booking pictures. I so admire those who do this and have these great treasures. We went camping but not to camp grounds, but to people’s homes that took us in. Sometimes it was country homes. One time I stayed in a rich person’s home that had a Huge boat with cabin below and they went to a big beautiful church. All I have great memories but no pictures or letters. I enjoy all your visuals. I found this post card with the memorabilia packed away with the slides and brochures of my Trip of the West. Not sure how it got there – maybe because it represented travel to someplace else. I’m glad you enjoy the visuals. Cliff scans them, dresses them up sometimes so I can post them here. Otherwise, you’d just be getting iPhone pics from me – ha! My first memory of camp at Little Eden in Michigan with my family is a “told-to-me” memory: how Daddy talked me into giving up my pacifier by hanging it high on a log beam in our cabin and telling it bye bye. He could be very convincing and it apparently worked. I was maybe 2 or 3. Laurelville was a favorite place as well. My family traveled to several Mennonite camps for vacations, including a week at Laurelville (can’t remember the year) and Silver Lake Mennonite Camp in Ontario. In retrospect I appreciate how this expanded our view and experience with various Christians and Mennonites. I just read your post on Cap Amigo with the slogan In Harmony with God and Nature, a complement to your blog title. “Little Eden” rings a bell, but I’ve never heard of Silver Lake in Ontario. You have had so many camp experiences, Melodie, and one rich life too. I really enjoyed reading this and can connect with many of the things you said…….like the song “How Great Thou Art” & “I owe the Lord a morning song” I wanted to go to camp but our family didn’t have the finances since I was the oldest of 8 children. I do have memories of traveling to Northern Penna to teach VBS with youth from Maple Grove Mennonite Church. All the staff lived in a hunting cabin for two weeks…..Those were my “camping days” 🙂 . A hunting cabin for two weeks sounds like camping to me. And you could enjoy all of it with like-minded people. Thanks for the comment. I may have met James and Rachel Metzler when I went to EMC in the sixties. Yes, Laurelville is delightful and still going strong as you can see from the link. Marian — “Orange Nehi.” Just reading the words brings the taste right back! Our annual camp was FOREST HOME located east of San Bernardino in southern California where we stayed in teepee villages for a week at a time. Our big excitement was having to shake our shoes out in the morning to make sure they didn’t have scorpions in them; keeping our palm-sized boxes of cereal away from raccoons; watching “ant lions” at the base of trees in their dirt-hill homes, seeing who could spit watermelon seeds the furthest, and singing around the campfire at night. Great times were had by all! I can picture it all including the pointy teepees. Bet you won the watermelon seed spit! I was one of those kids who never went to camp. I did go and stay with my grandparents when my mother needed some space or she’d ship me off to a cousin’s house. The stays with my grandparents were boring and scary. If I didn’t clean my plate, they told me the wolf who lived in the pump house across the street would eat me. Going to stay with my cousins was much more fun without a wolf in sight. Marian, If I remember right, you, Hazel and I went to camp. I don’t think Millie went. My dad took us out and I think Parke brought us back. It’s hard to remember every thing. You can relate to this adventure and others, Gladys. I’ll count on you as my accuracy checker, when it comes to details of our shared experience. We’re looking forward to seeing elk tomorrow. I’ll be in touch about details. That post card is something to treasure . I have always found joy in camp fires , still do . Sitting round a campfire eating something hot , sausages , jacket spuds etc just brings out the child inside don’t it Marian. I was in the girl guides ,as a child , and I remember having a few days away in a youth hostel . We all had a midnight feast . Each and everyone of us gathering supplies thoughout the day , then midnight came , or thereabouts , and we shared our bounty , plus stories from our days adventures …what fun . Thank you for focusing on camp-fires, Cherry. It sounds like Girl Guides helped develop your story-telling abilities. Sharing in youth hostels too. Well, and all the yummy snacks! My memory is hot dogs (wieners) and toasted marshmallows and s’mores. What fun indeed! On the bus on the way to camp, my friend and I realized that nobody knew us, so we were free to be anyone we wanted to be. We changed our names. Susan became Mandi, and I became her ultra cool tomboy friend, Randi. Changing my name gave me confidence to be a better athlete. I hit and caught like a winner. It sounds like the title of a book or short story: Change your Name, Be a Winner! Love this anecdote; it fits here perfectly! Good idea, Marian. I might right a short middle-grade-reader story about this and send it off. That should be write a story, right? A great post, Marian, and I loved the post card. But I especially enjoyed the list of things you did NOT do–it reveals so very much!–and the reasons you gave were delightful. Thank you, Marylin – your enjoyment is my reward! 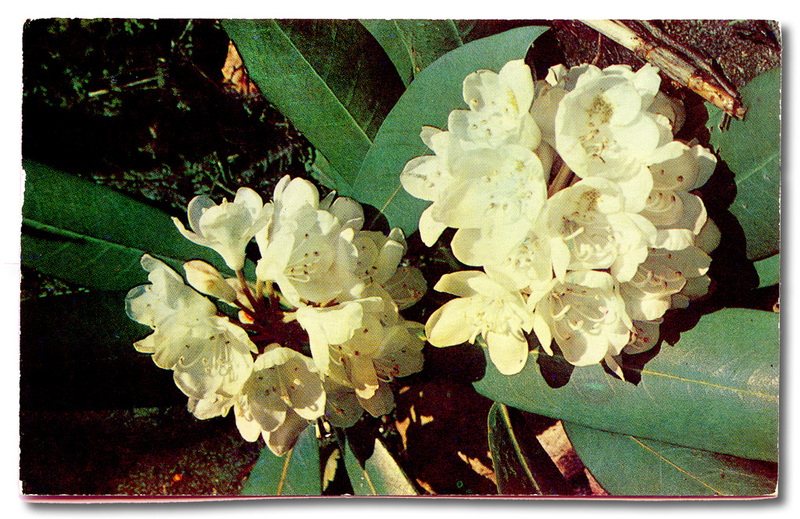 I believe it was Eudora Welty who said that a sheltered life can be a daring life, referring to her own experience. My “daring” of course came later. Ha Ha! We do a lot of comparing and contrasting in this space, don’t we. Thanks for the memory share, Judy. Here’s your chance for a vicarious experience, Debby. Thanks for stopping by! It warms the cockles of my heart knowing that you in a different season (a different hemisphere, really!) are enjoying this great hymn with me. I hope you enjoyed your son David’s brief visit – Of course you did! My heart was on fire with the song and the sunset. It was a hint of where my search for the sacred might lead me. Much better than “If I should die before I wake . . . ,” don’t you think! I always loved camping in the woods when I was a teenager. We didn’t have organised camps though. Nice to see you here again, Marie. I guess your family went camping or you went with friends. Either way, you enjoyed the outdoors, so obvious from your own postings.